If you’re trying to perform maintenance on your car, truck, or van, you need a way to get it up off the ground. And if you’re going to get it up off the ground, you’re going to need a set of ramps. There are a number of terrific car ramps on the market today, with each set containing its very own benefits and drawbacks. Car ramps are typically made out of metal, rubber, or plastic, and are capable of holding up large amounts of weight. Looking for the best car ramps available? If so, read on. This guide has all of that information and more. What Should You Consider When Buying a Car Ramps? The first set of car ramps on our list is this set from BUNKERWALL. While it’s certainly on the expensive side, it’s only because it provides tons in the ways of durability, traction, and overall construction quality. In fact, it’s safe to say that these are the best car ramps on the market today. They’re made out of high density polyethylene, an extremely strong plastic that can withstand tons of wear and tear. At a maximum, they can hold up to 10 tons of weight. This makes them appropriate for cars, trucks, and SUVS of just about any size. 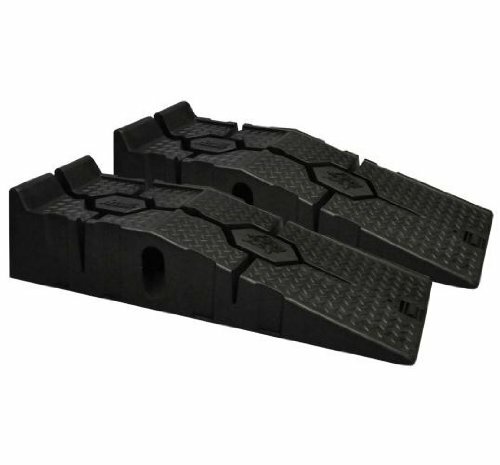 These ramps measure in at 6.5 inches high x 11.4 inches wide x 47 inches long, giving them terrific lift capabilities. Weighing in at around 42 pounds together, they’re fairly easy to move around and store away. All in all, these are the best car ramps you can find. 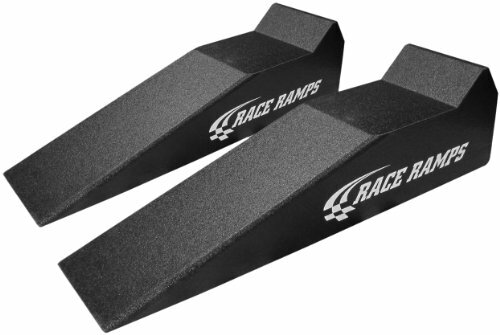 Next up on our list are the Race Ramp RR-40 car ramps. These ramps are available for a mid-level price, and offer quite a bit in the ways of construction quality, weight capacity, and durability. They’re made out of a combination of steel and high density plastic, giving them supreme durability. At their peak, they can hold up to 8 tons at one time. This allows them to accommodate the vast majority of automobiles. 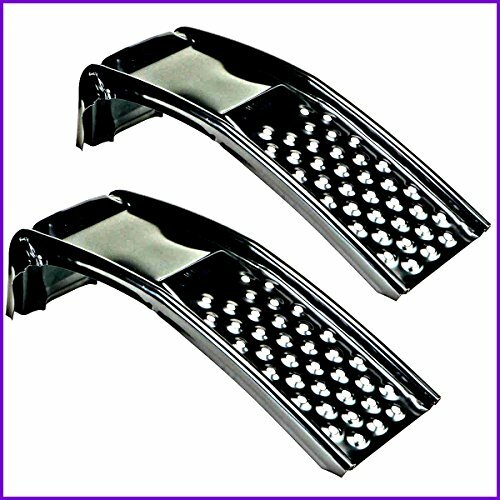 These are ideal for low-sitting sports cars, possessing a max height of 7 inches. They measure in at 8 inches wide, and provide 40 inches of total length. Weighing in at around 10 pounds each, they’re exceptionally easy to move around. All in all, these are stellar car ramps. If you’re looking for a great set of car ramps at a very reasonable price, you might very well consider the RhinoGear 11912s. 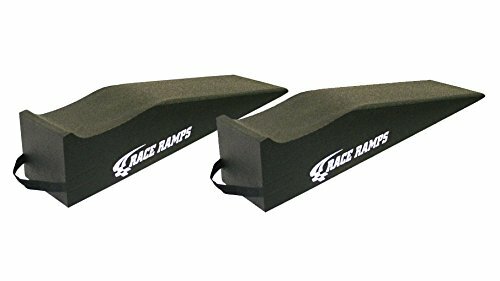 Available for about a third of the price of the Race Ramps ramps reviewed above, these ramps offer tons in the way of durability and construction quality. They’re made out of a combination of rubber and heavy duty plastic, and are capable of lasting through years and years of use. They possess a 17 degree incline and top out at around 6.5 inches in height, making them tall enough for vehicles of all kinds. At their peak, these ramps can hold around 8 tons of weight. In essence, there’s no car that they can’t hold. They measure in at around 10 inches wide and 35 inches long a piece. All in all, these are a terrific set of budget car ramps. 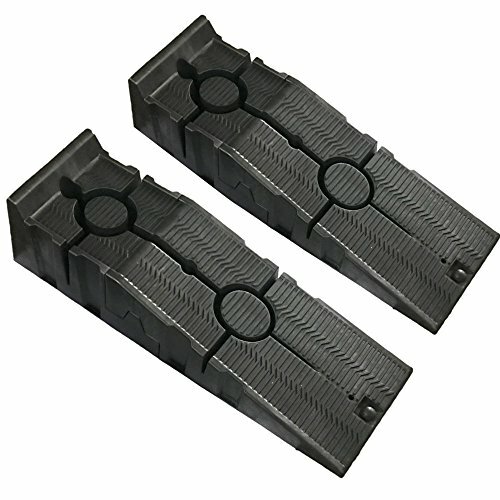 Another solid set of budget carp ramps is this set from Road Star. 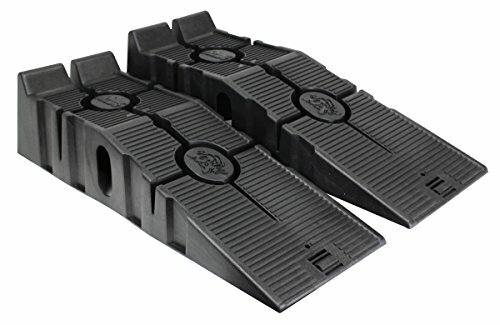 These ramps don’t hold as much as the RhinoGear ramps reviewed above, but are still fairly durable and functional overall. They’re ideal for small sports cars. They measure in at 6.5 inches tall, 9 inches wide, and around 38 inches long, accommodating the vast majority of cars. Angling up at 17 degrees, they possess a rough, textured surface, ensuring that there’s no slippage. In total, they can hold up to 6 tons, or 12,000 pounds. Made out of a combination of rubber and heavy-duty plastic, they possess above average durability. All in all, this is a very solid set of budget car ramps. RhinoGear makes our list again, this time with the 11909ABMIs. These ramps are available for a very affordable price, but still provide quite a bit in the ways of weight capacity, durability, and overall construction. These ramps max out at around 6.5 inches high, with widths of around 9 inches a piece. This makes them most appropriate for low-sitting cars and mini vans. At their max, they can hold weights up to 12,000 pounds, or 6 tons. They’re made out of a combination of rubber and high density plastic, and are designed to last for years and years of use. With a 17-degree incline, they do a terrific job of getting low-sitting vehicles lifted so that you can see under them. All in all, these are excellent budget car ramps. Next up on our list are the Race Ramps RR-30 Rally Ramps. These ramps are available for a mid-level price, and are pretty standard in the ways of durability, weight capacity, and overall functionality. They’re made out of high density plastic which is designed to withstand large amounts of weight. At their peak, they can hold around 10,000 pounds at once, or 5 tons. This allows them to accommodate the vast majority of cars, vans, and trucks. They sit 5 inches off the ground, making the more appropriate for vehicles which don’t sit too close to the ground. Measuring in at 10 inches in width, they’re 30 inches long. All in all, these are good, but not great car ramps. 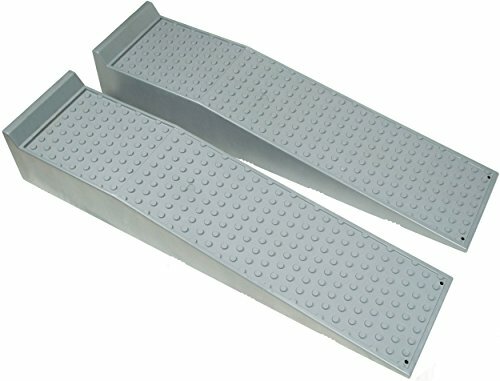 If you’re interested in a set of metal car ramps, you might consider the Nicky Nice Solid Steel Auto Ramp Set. These car ramps are available for a very reasonable price, and, while they don’t possess huge weight capacities, are still very sturdy and solid. At their max, these ramps can hold around 6,500 pounds of weight. This makes them appropriate for most small cars, vans, and trucks. They measure in at 8 inches tall, making them a great deal taller than many ramps on the market. As far as width goes, they measure in at 9 inches. As was mentioned, these are metal ramps. They’re made out of heavy-duty steel which is built to last through years and years of use. For traction on the way up, they’re equipped with textured holes. All in all, these are solid car ramps. If you need something with a lot of height, these would be a great option. Another solid set of budget car ramps are these ones from Discount Ramps. These car ramps don’t possess the weight capacity of higher-end ramps, but are still big enough to accommodate small cars. They max out at around 2.75 inches in height, making them most ideal for cars which already sit fairly high. In terms of width and length, they measure in at 8 inches and 27 inches, respectively. In total, they can handle around 2 tons, or 4,400 pounds of weight. They’re made out of heavy-duty plastic which possesses fairly standard durability. It should last you at least a few years. With a textured surface, it provides terrific traction for your vehicle. Overall, this is a good budget set of car ramps. Another set of metal car ramps are the House Deals Solid Steel Ramps. Available for a mid-level price, they provide quality similar to the steel ramps reviewed above. Of course, they’re also about double the price. At their max, these ramps can hold around 6,500 pounds of weight, making them strong enough for most standard vehicles. They measure in at 8 inches in height, 9 inches in width, and 35 inches in length. These ramps are made out of heavy-duty steel which is built to last through years and years of use. They’re equipped with textured holes, helping to provide traction for your tires as they make their way up. While these are very solid car ramps, they’re really no better than the cheaper Nicky Nice ramps reviewed above. 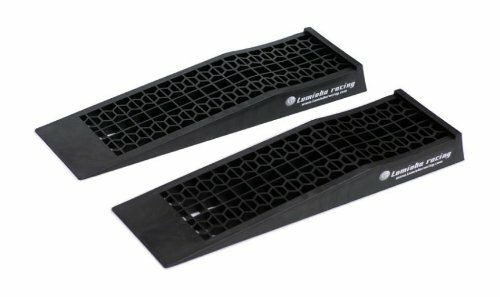 The last car ramps we’ll review are the Tomioka Racing Super Slopes. These are available for a very reasonable price, but provide only the standard in terms of overall quality. At their peak, these ramps can hold up to 4,000 pounds, or 2 tons. This is enough weight capacity to accommodate most small cars, vans, and trucks. They measure in at 2.5 inches in height, making them most ideal for high-sitting vehicles. They’re made out of a heavy-duty plastic which is built to last at least a few years. The good thing about they is that they’re very portable, weighing in at just 5 pounds each. There are tons of different sets of car ramps on the market today. While they may all seem very similar, they are actually all quite different. When choosing a set, there are a number of different things which you must consider. These things include construction quality, weight capacity, traction capabilities, and size. In general, car ramps are made out of one of three different materials: metal, plastic, and rubber. Typically, metal car ramps are the strongest and most durable. However, rubber ramps also do a terrific job of holding weight and withstanding abuse. Plastic ramps can be ridiculously strong, or very flimsy. Car ramps can hold up weights of all different kinds. While some sets can hold up a total of 3,500 pounds, other sets can hold upwards of 16,000 pounds. When choosing a set, it’s important to consider the weight of your automobile. If you’ve got a truck or SUV, aim for something with a higher weight capacity. If you’ve got a small car, you can get by with lower weight capacities. After you’ve rolled your automobile up onto your car ramps, you want to ensure that it stays put. In order for it to do so, your car ramps need to provide sufficient amounts of traffic. 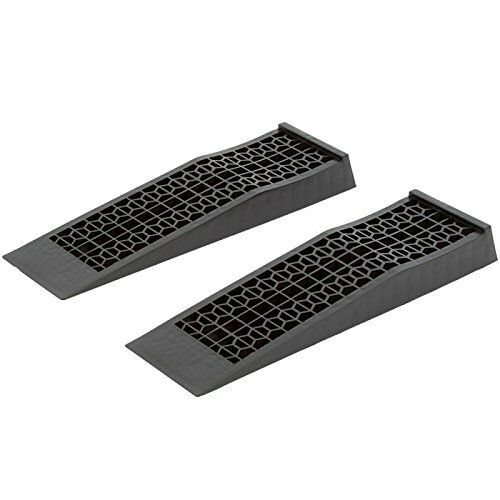 Rubber and plastic ramps typically provide enough traction through texture alone. Metal ramps generally need grooves in order to keep a car locked in place. The size of ramps you buy depends on how low your car sits. If you’ve got a high-sitting truck, you can make due with rather short and stubby ramps. But if you’ve got a car which sits inches from the ground, you’re going to need ramps with a great deal more height.